Team Handball is widely considered one of the most popular sports in the world outside of the United States. Handball made its debut at the Olympic Games in 1936 and became one of the most attended sports during modern day Olympiads. The International Handball Federation (IHF) works with 181 national federations. The sport is played in 183 countries with an approximate total of 19 million registered players and over 795,000 teams. Beach Handball is the outdoor version of Team Handball. The new sport erupted in the 1990s in Italy, and is now rapidly gaining popularity. While finding success around the world, both sports remain relatively unheard of in the United States. Beach Handball is rapidly gaining popularity as a sport across the world. Dede Piankova is working hard to change that. She is the USA Beach Handball Committee chairwoman and a USA National Beach Handball coach. She recently consulted with United States Sports Academy President and CEO Dr. Thomas P. Rosandich, who served as the USA Team Handball president during the 1996 Atlanta Olympic Games. Dr. Rosandich says he believes that Beach Handball is more exciting than the indoor version and could become more popular, like beach volleyball has become compared to indoor volleyball. It is an excellent introduction and boost to the indoor handball game, as well, he says. “I am honored to carry the torch until Beach Handball is the most popular outdoor sport in America,” Piankova says confidently. The fast-paced, fair-play and high-scoring game of Beach Handball has become an official sport of the International Handball Federation (IHF). The sport is also recognized and approved by the following major sport agencies and organizations: International World Games Association, SportAccord, European Olympic Committees, Olympic Council of Asia, International Committee of Mediterranean Games, Bolivarian Sports Organization and South American Sports Organization. Piankova says that Beach Handball is an additional, promotional, competitive and recreational handball activity, but it is not a surrogate of Olympic Handball. Beach Handball has its own history, philosophy, specific development, sport analysis, training and coaching, rules and regulations, she adds. The rules are slightly different to indoor Handball. Played on sand with a rubber ball, by two teams of four, with four substitute players per team, the action is fast and furious on the relatively small court—27 meters long and 12 meters wide (88.6 feet by 39.4 ft). Regular goals count one point, but two points are awarded for the spectacular goals, such as those scored in-flight, through a spin shot or by a goalkeeper. There are two, 10-minute halves, and the winner of each half is awarded one point. In case of a tie, each team gets five shots in a shootout. The American women’s team competed in Montevideo, Uruguay for the 2012 Pan American Championships. It was the first time the U.S. team has participated in 10 years. “It marked a solid starting point for continued development and success in the international arena of Beach Handball for the USA teams,” Piankova says. The World Championships for men and women were started in 2004 and are held every two years. In 2012, both Brazilian teams won the Beach Handball World Championships in Oman. 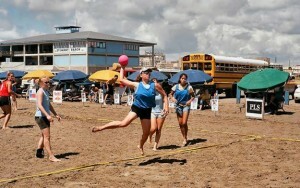 The USA Beach Handball Committee Strategic Statement was released in March, and states that it plans to increase popularity of the sport in the United States and compete on the international stage. Also on Piankova’s side to help are George Bebetsos, who is on the USA Beach Handball Committee as an International Executive Adviser, and Giampiero Masi, the first Chairman of the IHF Beach Handball Working Group. Coming up for the United States and world Beach Handball teams: The 2013 World Games in Columbia, the 2014 World Championship and possibly the 2016 Rio de Janeiro Olympic Games. For more information about USA Beach Handball, contact Dede Piankova at dede.piankova@usabeachhandball.org or call her at 512-275-6777. Piankova is the USA Beach Handball Committee chairwoman and a USA National Beach Handball coach.